Modern Calvary is made up of tanks and other machines, but Fort Hood has a way to remind people of what the cavalry used to be like. Every Thursday they put on a free demonstration of how horses were used in warfare. This is a fun show for any horse lover. And for people who love explosions there are gun shots and cannon blasts throughout the show. Location: East of the Fort Hood visitors center located on TJ Mills Blvd. 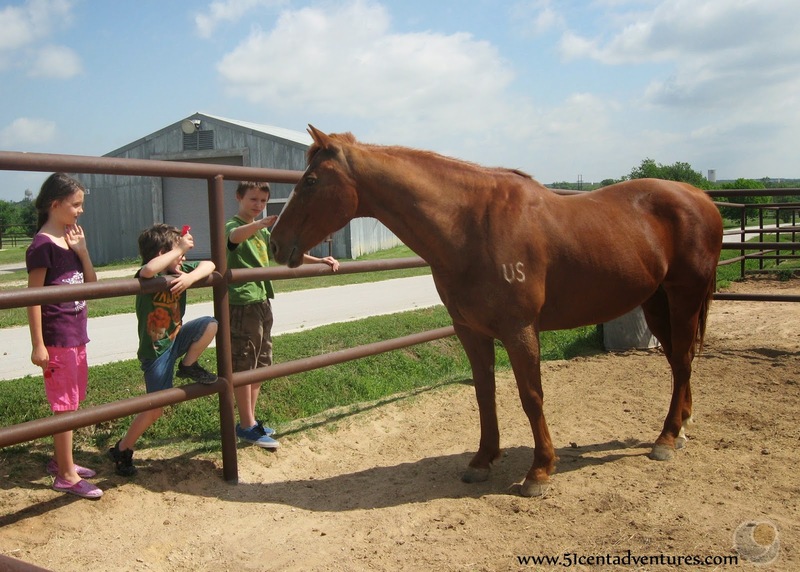 You don't need to go through any of the Fort Hood gates to reach the barn and stables. See the map at the bottom of this post. Operating Hours: The weapons demonstration occurs every Thursday at 10:00- weather permitting. Tours of the stable and barn are available anytime throughout the week. Recommendation: Fun way to see some living history. I have four kids under the age of four. None of them are in preschool. We are together pretty much all the time. We can get pretty sick of being home together. That means I'm constantly on the lookout for fun things to do away from home. Since my kids are all so young I have to be careful where I take them. I prefer to do things that are free so if we need to leave in a hurry we haven't wasted any money. When I heard that the Horse Cavalry Detachment here at Fort Hood puts on a free weapons demonstration every Thursday it sounded like something my kids would enjoy. They like horses so I knew they would have fun watching them. I was a little worried how they would do with the gun fire. My 2 year old son cried every time he heard a gun shot during a mock bank robbery show in Tombstone, Arizona. To be on the safe side, I asked an older couple to come along with me to the show so they could help out with the other kids in case my son needed me to comfort him. My kids were very excited to go to "the horse show." The first thing we saw was a large red barn. There aren't any horses in this barn. 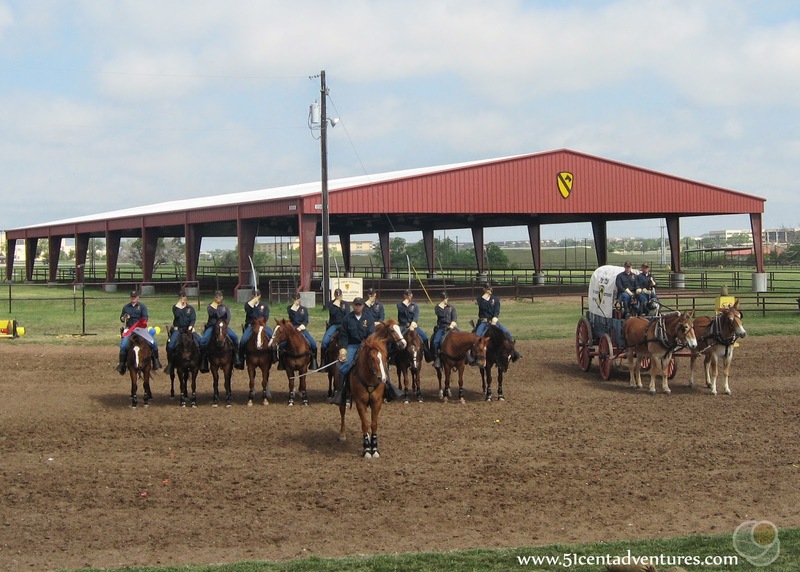 Instead it has the command offices for the Horse Detachment Soldiers. There were two permanent grandstand bleachers set up to the left of the barn. There were two elementary school classes already seated on the first few rows of each grandstand. Even with all the school kids there was a lot of extra room for families like us. The show was supposed to start at 10:00, but it didn't get going until 10:15. That was okay because there were lots of interesting things to look at. 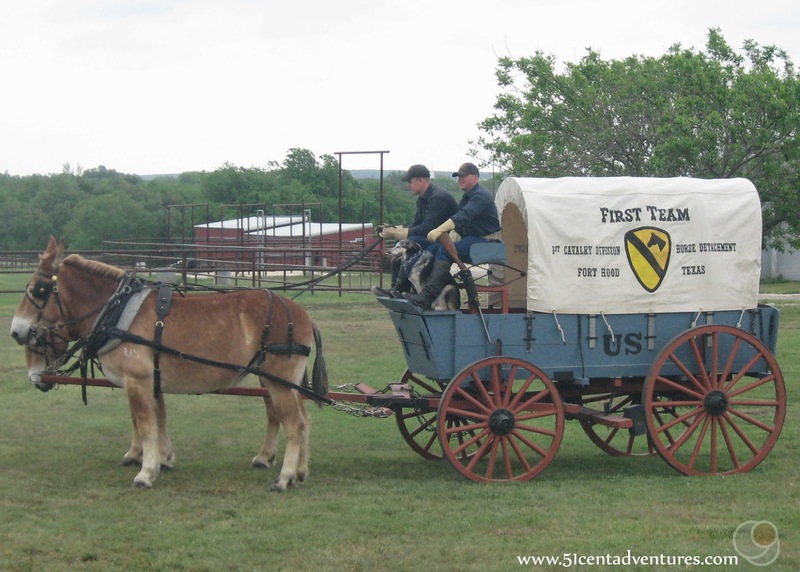 My older girls were especially interested in this wagon pulled by mules. The show was entertaining. The riders did different maneuvers to show off what the horses could do. They would do things all together, in pairs, and individually. They did special formations, jumped hurdles, and used their swords. The best part was when the riders would shoot their pistols. The riders would shoot at balloons on the ground while their horses galloped or jumped. The grounds crew made sure everything was set up for the riders. Horses used to be a crucial part of the Army. However, they are no longer used in combat. This detachment was created as a reminder of the days in the past when the cavalry and horses were synonymous. The cavalry still exists today. Only now it is made up of Tanks, Bradley Fighting Vehicles (my husband drives one), and Helicopters. The best part of the show was the end when the soldiers rode out with a bugle playing and guns blazing. A lot of balloons met their demise. Here is a video of that. And yes, that is my son crying in the background. I thought we would just leave after the demonstration ended. So I was pleasantly surprised when one of the riders came over to my family and invited us on a tour of the barn and stables. He told us some facts and stories as we walked. Not only does the detachment care for the horses, but they also make saddles and horseshoes. We ran into my neighbor and her kids during the tour. 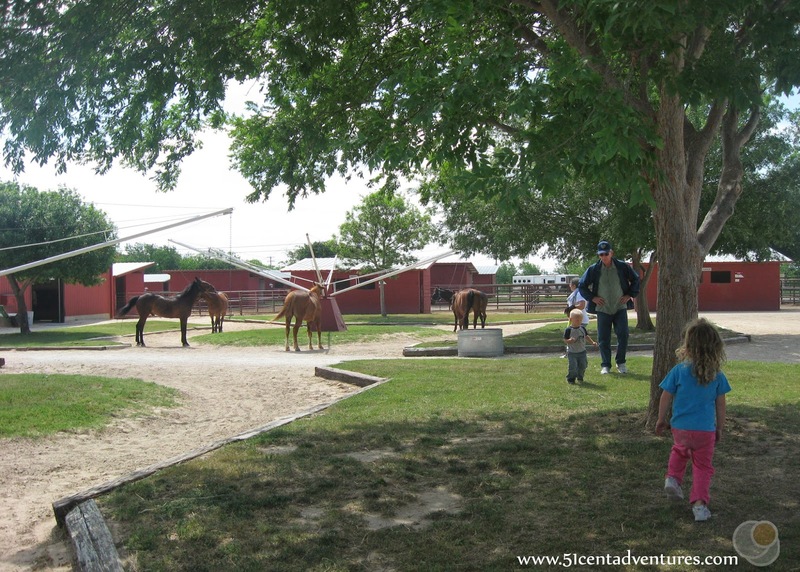 All of us went out to the yard area together where we had the opportunity to see all the horses. My kids lost interest pretty quickly, but my neighbor's kids asked lots of questions and spent a lot of time petting the horses. The area was very large and we could have looked around for a long time. However, my kids were done paying attention. I knew we could come back anytime we wanted so I decided to just call it a day. I think my very favorite thing about the whole outing was how close to home we were. Usually we have to drive for at least 20 minutes to visit anything of interest around here. This was less than 10 minutes from our house. That alone made it worth it. 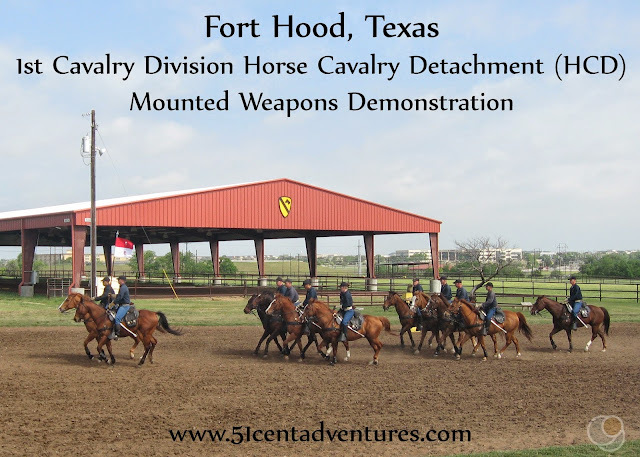 Fort Hood is an hour north of Austin and two hours south of Dallas. Texas Highway 190 runs south of the main part of Fort Hood. Take the TJ Mills Boulevard/Main Gate exit. If you are planning to see anything on post you will need to stop at the Visitor Center to obtain a gate pass for your vehicle. Make sure you have your drivers license, vehicle registration, and proof of insurance. However, You do NOT need a visitors pass for access to the barn and stables. The barn is located east of the Visitor's Center. 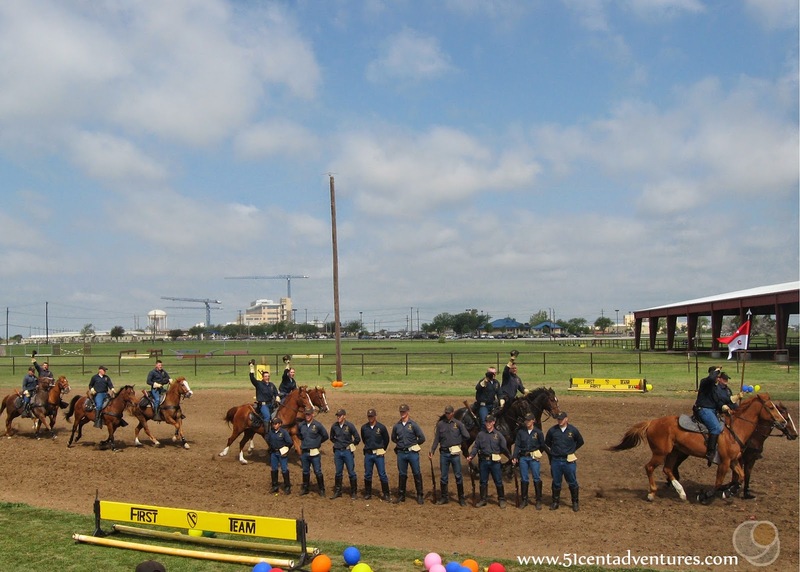 There is a small sign that says "Fort Hood Riding Club Barn and Stable." Follow that sign. The road curves and within a few yards you will see the demonstration field, the grand stand seats, and the barn. If the parking lot is full you can park on the grass on the right side of the road. Photo used with permission from Fort Hood Area Events. Places nearby: If you are interested in military history you should check out the two on post museums. 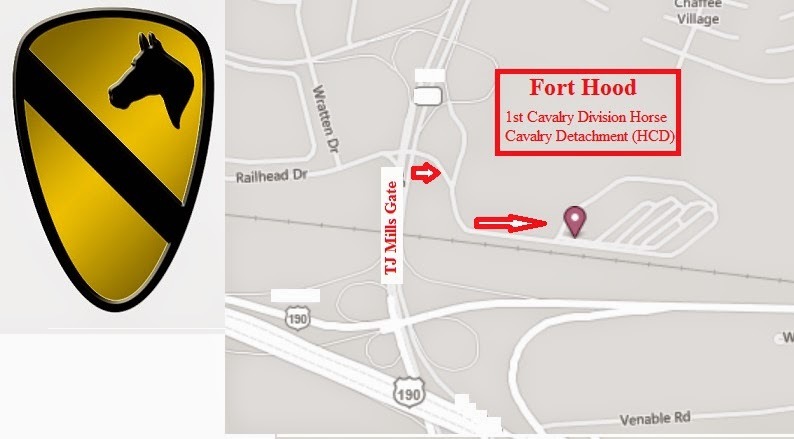 The 1st Cav museum is located on 56th Street & 76th Tank Battalion Ave. 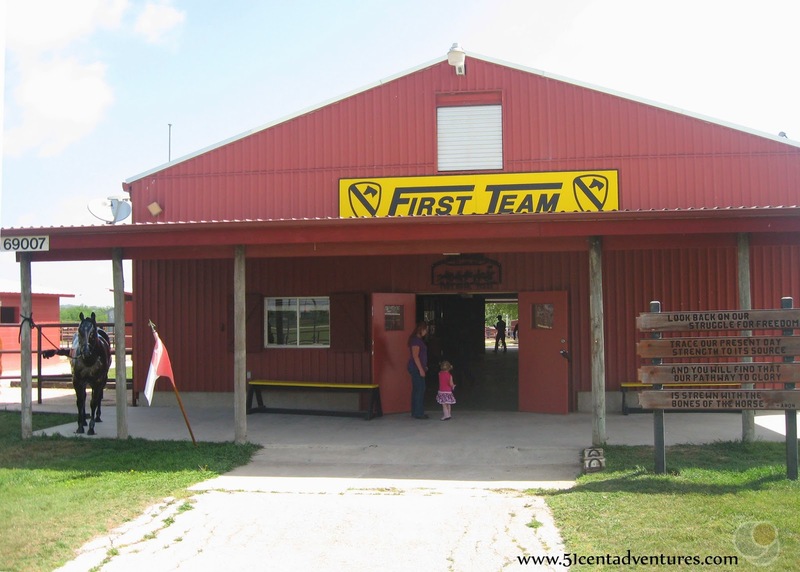 The 3rd Armored Cavalry Museum is located on 36th St & 761st Tank Battalion Ave. This one is really cool because you can see actual Tanks, Bradleys, Helicopters, and other vehicles from the Army's history.